Very nice and clean app. With v0.2: How to switch between the different accounts on the main pager and after having logged in into the first account? You need to open "Settings" via the pulley menu. Improvements to that behavior will come in a later version. File what you are going to delete is hidden file (if first character is "." it's always hidden), you can't see it via filemanager unless you go filemanager settings and enable "hidden files and folders". Also if you want do same via cli/terminal basic "ls" command not shows these hidden files/folders, you must use "ls -a" command to see them. You do not need root priviledges to remove this .config file. Hello thanks for the app. I have a question. I downloaded the app and got the key. Now when I start the app it ask me for an authentication, but I never set up a password or a pin. Is there a way to reset the app ? Thanks for you help. 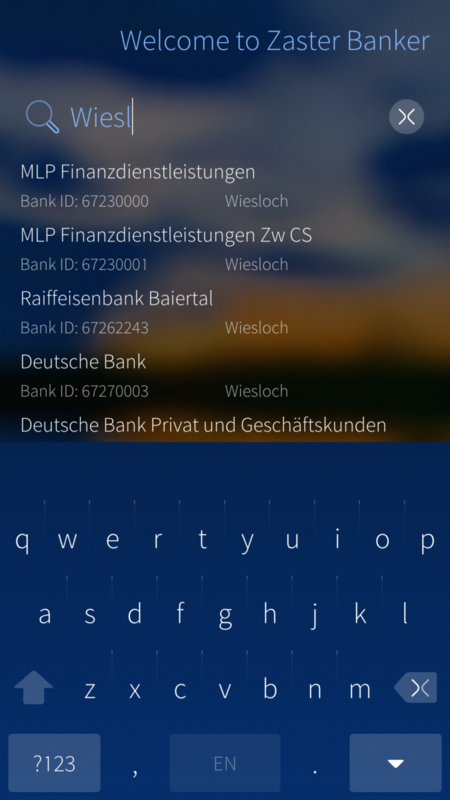 My bank (Volksbank) uses FinTS, but my accounts only accessible with keyfiles. Does zaster support key-file bank accounts? Unfortunately not, only PIN/TAN is supported. I'm thinking about buying, but I noticed that my giro account is supported, but I can't check my savings account and Master Card account (all 3 Postbank Berlin). Would be nice if these two would work too. Sounds very promising, thanks for the effort. I will definitely pay for this app if it works with my bank. And that's my issue: after the first (unsuccessful) login attempt I am missing an option to edit or remove the bank account. The only control is the PIN/password field. Am I missing something? 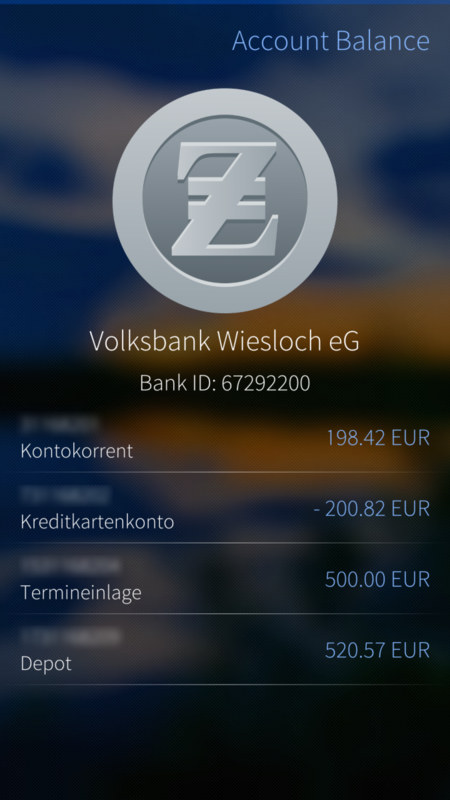 Such an option will come with one of the next versions - together with multi-bank support. For the time being, please remove the directory /home/nemo/.config/harbour-zaster to get a fresh start. If login still doesn't work, please open an issue with a complete description (which bank, which error message etc.) on GitHub. Thanks! If it calms you down I can guarantee that your bank credentials are not transmitted to any third party. Zaster Banker directly connects to your bank's given API endpoint via SSL/TLS and only stores your account metadata on your device (see /home/nemo/.config/harbour-zaster). WerkWolf doesn't know anything about that. This metadata (so your bank account number and it's capabilities for API access such as API version number) is encrypted by SimpleCrypt https://wiki.qt.io/Simple_encryption_with_SimpleCrypt - which is not a strong encryption, but unless sailfish-secrets is stable, it's hard to become better. Maybe there is an option to encrypt that better using libcrypto in the near future. However, the most important thing is that your PIN/password is NEVER stored on your device - it only lives in memory as long as you use the app. That's why you need to enter it each time. Moreover, everything is read-only so far - there is no implementation of any money transfer yet in the software and would anyway require two-factor (TAN) authentication as well. So, being paranoid myself, I chose that it's totally fine to use it... But in any case, there is always a risk when you use mobile applications and there is no guarantee that you are completely safe. You need to balance the risk/convenience ratio yourself. Another feature request, if you may. :) Would be nice to see Finnish bank support. Samlink at least has quite a lot of documentation about the payments, transactions, etc. They might require a service agreement with the banks (was mentioned in some of the documents). So not sure how open the API is or if it'll cost anything. There's also a (bit unmaintained) API for most of the Finnish banks, so might need some testing and probably a fork: FpiAPI Api for making Finnish web payments via a handful of banks and Luottokunta. So as a summary, the situation in Finland is quite "random" some banks support the PSD2 and even provide a developer API, some don't. The best approach at this time would be to directly ask from the banks if they have an open API available. Nice idea ! 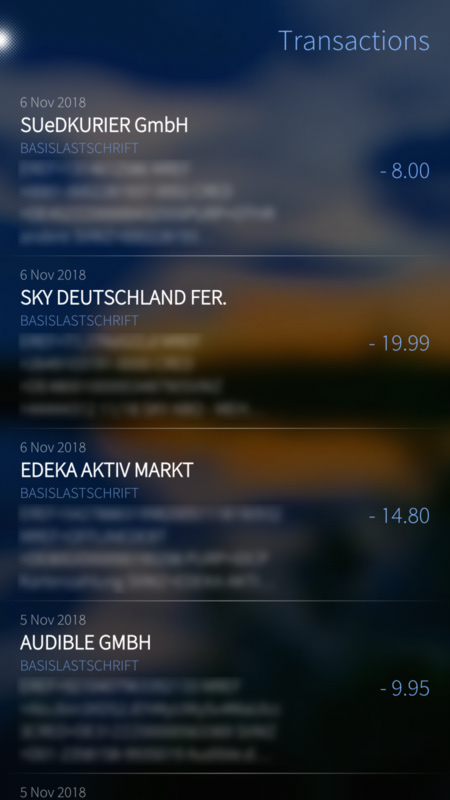 Could not find my bank: Easybank. Do.they not.support the api or are they not on your list ? Thanks for this app. Highly appreciated. A suggestion: will you support multiple bank accounts? It seems, I'm currently limited to one. And: do you have plans to support initiation of transactions? You can take all the money you want directly from my bank accounts if you can extend that to other banks within Europe and help everyone getting rid of Android and Google services for good. I suspect they use other APIs, bur I hope you can add N26 (German) in the future, and then other countries (one vote for French banks here). N26 has its own API, but support might be feasible. If the other banks have an open API, they can be supported as well. However, no promises yet as everything needs to be checked and evaluated first.